If you have an extra six minutes and you're into football, then I'd encourage you to watch it. If not, I'll summarize it for you. In the divisional round of the 1979 NFL Playoffs, Youngblood fractured his left fibula against the Dallas Cowboys. Obviously... team doctors told him he wouldn't be able to finish the game. His response? Tape it up! Youngblood ended up finishing the game, then playing the following week against the Tampa Bay Buccaneers, and two weeks after that in Super Bowl XIV. All on a broken leg. If that weren't crazy enough, he also played the following week in the 1980 Pro Bowl. Bottom line was this guy is either one of the most courageous NFL athletes to play the game, the craziest, or both. As soon as I finished the video, I headed over to COMC to find either an autograph or rookie card of The John Wayne of Football. You can pick up his rookie card for as low as a dollar, while there are several on-card autograph options to be had for under ten bucks. It set me back $35 (free shipping), which is kinda pricey... but I was happy to add this to my autographed rookie card collection. Well the big game is set to begin in a few minutes. I'll be quietly rooting for the Rams. However I wouldn't be too disappointed if Brady won his 6th Super Bowl title. Happy Super Bowl Sunday and sayonara! "However I wouldn't be too disappointed if Brady won his 6th Super Bowl title." This is the most un-American thing you've ever said. I gotta agree with Zippy. Holy cow! That is a whole new level of commitment. Either team winning has some great storylines. Cheers buddy! He has a nice autograph. That must have made it easier to buy. 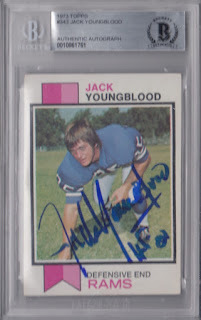 I thought Jack Youngblood was awesome when I was a kid. Don't need his autograph but definitely need his '70s cards. I have an "unsigned" Youngblood RC card. Very disappointed the Rams fell to the NE DyNASTY. It was a great game on the defensive side, but once Brady tossed that TD it was GAME OVER. Very nice post about Jack Youngblood. I remember him as a player and he was awesome! I'm also very disappointed that the Rams lost. The Rams defense played their hearts out and Brady wasn't very impressive but he did just enough. Compared to last year, the Rams are definitely moving in the right direction. 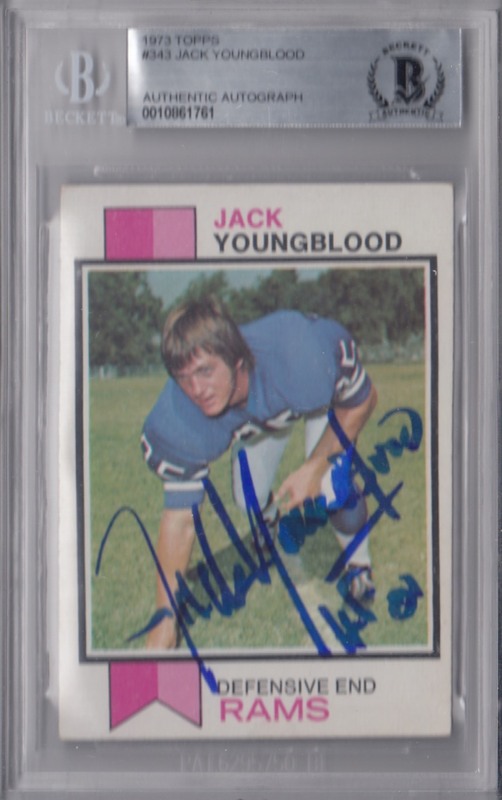 A jack Youngblood auto is one of the only football cards I've kept in my collection. night owl - the good news is if his rookie card is that affordable, i'm assuming his other stuff is as well. best of luck. bbcardz - yeah that rams defense is tough. they'll be good for years to come. gcrl - i was suprised at how affordable they are. collecting cutch - thanks. yeah... it lacked offensive excitement. A lot of old school players do. You can almost break down every single letter in his signature.